Ashwaubenon, Wis.- The Green Bay Booyah have announced that their 5-Game Membership A ticket package has sold out. 5-Game Memberships for Membership package B are still available, and the team announced today that they have created a third ticket package, Membership C, which is now available for purchase. The dates for both Membership B and C can be found below. 5-Game Memberships are designed to get fans to the best games featuring the best promotions at an affordable cost. Starting at just $99, less than $20 per game, fans receive tickets to 5 games, all-you-can-eat food & all-you-can drink Pepsi products, 20% season long merchandise discount, never-a-wasted ticket policy, guaranteed promotional giveaways, wristband for specialty food items such as deep-fried cheese curds & booyah, kid zone access and an exclusive Booyah baseball hat. 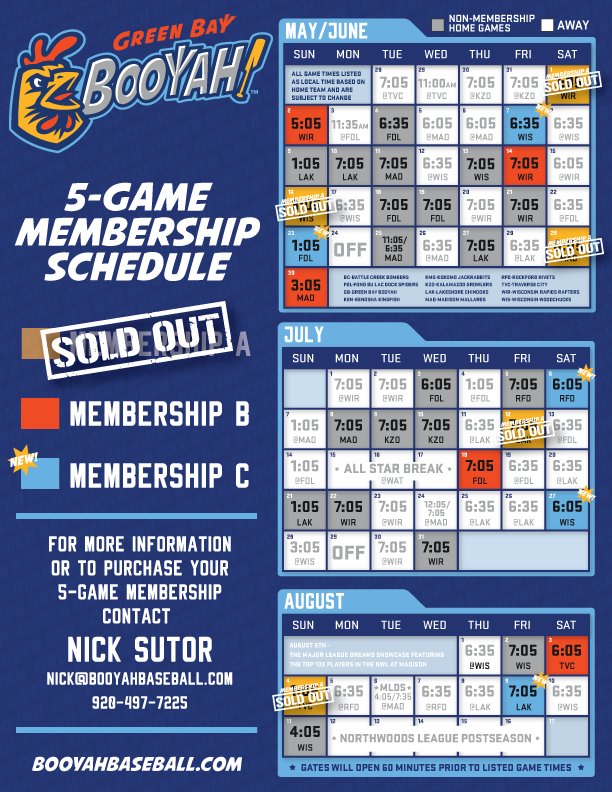 If you are interested in receiving more information or purchasing a 5-Game Membership, please fill out the form below and our Season Ticket Sales Manager, Nick Sutor, will get in touch with you as soon as possible!